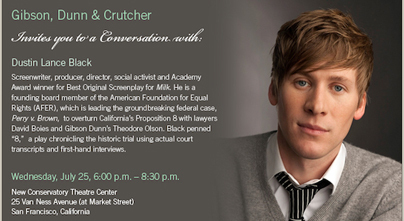 Gibson Dunn invites you to attend A Conversation with Dustin Lance Black, the Academy Award-winning screenwriter of "Milk" and writer of "8," a play based on the trial transcript in Perry v. Brown, the landmark federal constitutional challenge to California's Proposition 8. Mr. Black's play is produced by the American Foundation for Equal Rights - which Gibson Dunn helped found - and Broadway Impact. Mr. Black is a founding member of AFER and a longstanding supporter of marriage equality. The event will take place on July 25, 2012 at 6:00 p.m. at the New Conservatory Theatre Center in San Francisco, California. Chris Dusseault, Gibson Dunn partner and counsel to the plaintiffs in the Perry v. Brown case, will serve as our host for the evening. Please RSVP to Kate Dowd at kdowd@gibsondunn.com. Gibson Dunn represents the plaintiffs in Perry v. Brown, the successful federal challenge to California's denial of marriage to gay and lesbian individuals. After a three-week trial in San Francisco last year, the court held that California's law is unconstitutional under both the Due Process and Equal Protection Clauses. Early this year, the United States Court of Appeals for the Ninth Circuit upheld the district court's decision finding Proposition 8 unconstitutional.